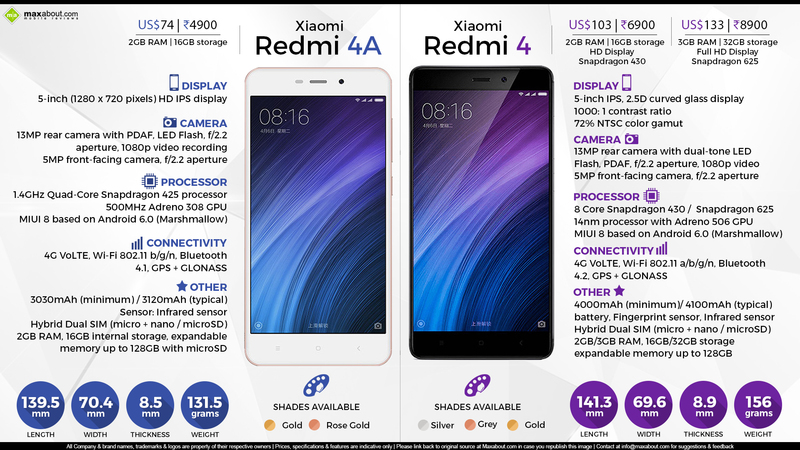 The latest range of budget friendly, high performance smart phones by Xiaomi now includes the Redmi 4 and Redmi 4A, officially announced in China few days back. The phones are updated with more features, supporting more technologies and carrying even better price tags. The Redmi 4 is offered in two variants, one carrying lower specs while other one comes with class leading features and performance figures. The standard Redmi 4 comes with 5 inch HD display with 2.5D curved glass. It uses a Snapdragon 430 Octa Core processor, paired to 2GB of RAM and 16 GB of internal space. It comes with 13 MP rear camera and 5 MP front shooter, The fingerprint sensor, 4G VoLTE support, 4100 mAh battery and 156 grams of weight makes it a good deal in 699 yuan (INR 6900). The high end Redmi 4 uses 5 inch full HD display, 2 GHz Octa Core Snapdragon 625 processor, 3 GB of RAM and 32 GB of internal storage. Rest everything stays the same as the standard version, except for the price tag of 899 yuan (INR 8900). Both these phones support microSD card via the hybrid dual SIM arrangement. The Redmi 4A is however the least expensive one, carrying a price tag of just 499 yuan (INR 4900 approx). It comes with 5 inch HD display, 1.4 GHz Quad Core Snapdragon 425 processor, 2GB RAM, 16 GB internal storage and a weight of just 131.5 grams. The battery measures 3120 mAh while it looses the fingerprint sensor from its feature list. The phone will be available in just Gold and Rose Gold shades. The same hybrid dual SIM slot is available on the Redmi 4A. It may be the least expensive Redmi phone launched ever in India, getting the same price tag as the first generation Redmi phone.